Cuil pronounced cool is a bright shiny new search engine developed by ex-google employee Anna Patterson that sets out to challenge the ubiquitous search giant. Being a narcissist I tried it out by typing in "modernemama" and instead of boring old text links I got shiny snippets of (mostly) my posts with images, although the pics didn't always match the posts. If I do the same with google I'm asked if I meant to type modern image! 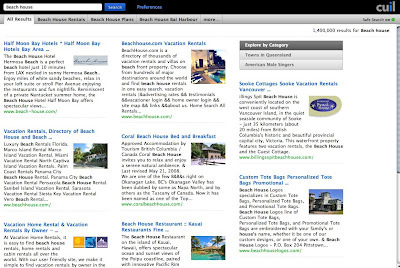 A search for "Beach House" presented me with tabs of Beach House Plans, Beach House Rentals and weirdly, Bal Harbor, Miami. The search got even more quirky when I selected "all results" and had to choose between Towns in Queensland and American Male Singers. And it came to an abrupt halt when the sub-category I chose under American singer Stephin Merritt, The Gerbils, failed to elicit any results. Bummer. This seems to be a touch of teething troubles as I had to give the search a couple of extra mouse clicks to stop it issuing that error message on other searches, but even so I think I'm going to be trying this out more and more in the future.